Nothing beats a pure water fast -the water ensures the quick and safe expulsion of waste during the fast as well as gives the faster a sense of "fullness". Also, the neutrality of the water in terms of taste or nutrients will not interfere in any major way with the normal fasting process itself. Any other fast, including the fruit or fruit juice fast may have the effects of either slowing down the fast and/or quickening the detox -as fruits can be aggressive cleansers. A healthy alternative to either the water or juice fast is the coconut water fast. Coconut water is the purest and healthiest water you can drink. Not only is it pure, filtered by the tree, but it is also sweet and nourishing, thanks to the ripening power of the sun. In fact, pure coconut water may be second only to mother's milk, and can make an excellent substitute or follow up. Coconut water may even be used as a plasma supplement during blood transfusions. The electrolytes contained in coconut water are excellent for maintaining the body in a hydrated state. Whatever the claims, this "nectar of the gods" is just plain good for you. There are basically two varieties of coconuts and several hybrids. The most common are the brown hairy ones we're all familliar with which are fully mature and have a lot of meat inside but not too much water(the water slowly becomes the meat). The younger variation of the brown coconut is whitish in color with a lot more water and a better taste. sweeter. Then there is the Thai or young coconut from southeast Asia which has the most water, the least meat, and the sweetest taste(pictured on this page). The brown coconuts have two "eyes" and a "mouth" which needs to be perforated to access the water. Once the water is drawn out(by drinking it from the hole, leaking it, or inserting a straw), it's cracked open for the meat, usually by hitting it around the middle. The young Thai coconuts, on the other hand, need to be defoliaged, and then macheted or "shaved" at the top, and finally pierced to access the water. They usually come sold without the green foliage, appearing whitish-beige, and wrapped in plastic. They may also be dipped in various chemicals to prevent spoiling. 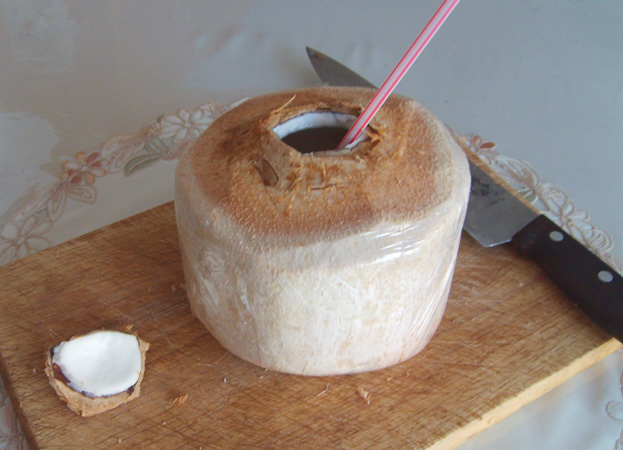 The abundant and sweeter water of the young Thai coconut makes it the preferred choice of the faster, although the younger whitish version of the brown coconut is also gaining in popularity. Once he or she has learned to extract the water, the faster can drink to one's desire and start accruing the benefits. Short fasts of a few days on coconut water are fine, but anything longer usually requires a transition diet beforehand, especially if you are new to fasting. Long-period fasting can release too many toxins too quickly, especially if you're just coming from the standard American diet, and some of these toxins can make you sick or even kill you. Years of bad eating and stored up toxins need to be released slowly and safely and this can be done by doing many short fasts or adopting a vegetarian or vegan diet. Depending on your age or condition, such a diet change usually takes months or years. Once the body is sufficiently clean, fasting becomes much easier and more productive. Vegans and fruitarians will have little or no problem going on a prolonged water fast, and especially a coconut water fast. People like Dan McDonald(liferegenerator) and Ted Carr(100 squats a day) have had no problems going on a coconut water fast for a month or more(see internet videos). John from okraw.com also has some excellent information on coconuts(https://www.youtube.com/watch?v=K_Bn90k7ifs). Coconut prices vary. The brown ones are usually betweeen one and two dollars while Thai coconuts usually sell for between two and three dollars each, less if bought in bulk. You do not have to drink 30-50 coconuts a day. I've done fine on three a day(especially when not particularly active). Runners and joggers or active people in general may of course require more. If you can't always get coconut water, melon water is a good substitute. I actually alternate between the two. A coconut water fast(depending on the length) will do wonders for your health, clearing up your skin, making you lose unnecessary weight, and helping you to detox and think clearer, while at the same time giving you energy and the best nourishment possible. Actually, all nourishment comes only from the Sun. We only take the sun force from foods and the rest is discarded. The denser the food the less sun force it has. There's plenty of sun force in coconut water and it's quite pure. A coconut water fast essentially makes you a liquidarian -at least temporairily. We were all liquidarians as infants when we only drank mother's milk and we will probably become so again once we undertake to purify our degenerative diets. I do find the methods or techniques of opening up a coconut rather crude or "violent" , as though you were cracking open someone's head, and truth be told, we probably don't even need coconuts(or any other food) to survive, but hey, one step at a time. Not everyone's ready to become food-free just yet. In the meantime, we can enjoy the delicious foods and drinks naturally prepared for us by nature herself.